Listed above free consultation listings in your city. Subscribing to Opticians Finder premium costs	£10 per year. Simply Click here to sign up for premium service. If you already have a free opticians listing and wish to upgrade, please visit your listing and click the large red button that says "Upgrade Listing". 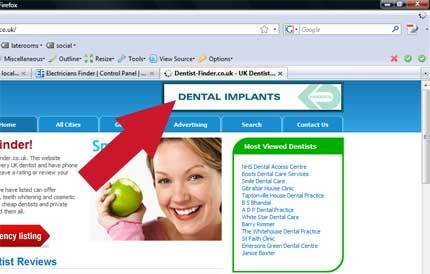 National Banner Service on Opticians Finder.co.uk . Advertising on opticians finder.co.uk will direct more traffic to your listing OR website, generating more leads and more revenue. Large colourful optician advertisements will attract users to click on it and be taken where you want. We offer a national banner advertising service, price & availability vary, Contact us to find more information.